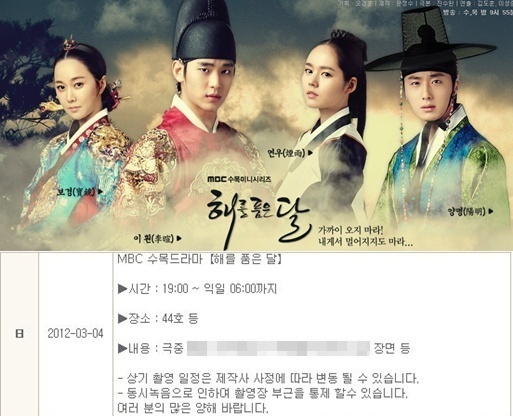 The grand finale of the MBC historical drama The Moon that Embraces the Sun leaked in advance online days before its final episode is set to broadcast on March 8th, 2012. The production team of The Moon Embracing the Sun is yet to respond to the leak. The main filming location of The Moon Embracing the Sun, Korean Folk Village, published a notice on its website over the weekend, saying that the last filming of The Moon that Embraces the Sun is between 7pm of March 4th, 2012 and 6am of March 5th, 2012, and thus may cause inconveniences to visitors. However, because of negligence of staff, the notice also included the filming content of “Seol who is dying in order to protect Yeom,” equivalent to leak the most important plot of The Moon Embracing the Sun in advance. The move of Korean Folk Village has led to dissatisfaction of many viewers of The Moon Embracing the Sun. Many viewers left messages on the website of Korean Folk Village, expressing that they couldn’t understand why such a mistake could be committed. So far, the production team of The Moon that Embraces the Sun is yet to respond to the incident.